GoToMeeting from Citrix is a Web Conferencing solution that facilitates virtual meetings between remote groups of people. This solution includes audio (Voice over IP), video (for face-to-face meetings) and sharing (desktop or files) functionality. Read our review below to get the lowdown and see if this is the right solution for your business. Web conferencing for business collaboration has become very popular with the advancement of VoIP technology and the growing costs and hassles of travel. GoToMeeting from Citrix grants powerful collaboration options via a multiplatform client, including select web browsers (Chrome and Firefox) with its free service option. The service is best described as a Conferencing service as this is the most recognizable feature of GoToMeeting. Upon closer inspection, one can see a much more extensive set of tools that aid in the virtual meeting process. Transmission of both voice and audio rely on secure VoIP transmission and further uses a proprietary codec to compress and decompress data. Meeting attendees utilize onboard (or external) hardware such as webcams, speakers and microphones to communicate during the meeting. If a user does not have such equipment available, it is still possible to attend a meeting with a phone call or via the official app. During a session, a variety of options are available to control the meeting. In meetings where multiple participants share ideas, control can be passed to various users during the session by the organizer. The options to toggle operation of attached peripherals is available with a simple click or two. When not speaking, the microphone on your device can be turned off (and on) with a simple click, which is useful when background noise is present, such as other voices or typing. The webcam/video feed may be toggled off (and on) too as this is not essential for every meeting. A Free plan is available for those that require meetings for up to 3 attendees. A meeting can be intiated directly from the GoToMeeting website where an updated version of Google Chrome or Mozilla Firefox will be necessary. After initiating a meeting, a link is produced for other attendees to join a secure session. Attendees can share their screen by downloading a browser extension or share a file on their computer device. The free version is quite basic but serves as a great option for very small businesses that only require basic conferencing functionality on an irregular basis. Paid versions are available starting at $39/mo when paid annually (or $49 month-to-month) for up to 25 participants. Up to 100 attendees is possible for $56/mo on the annual plan or $69/mo if on the month-to-month plan. Any plan grants unlimited access and full HD video support, along with 24/7 customer service. When we tested out the free version (using Firefox) we found the audio to be choppy at times with no obvious way to control microphone settings. The user interface was not overly intuitive as one would have expected, with no particpant's list available and functionality only included the basics of non-HD video, voice and file/screen sharing. However, that is the free service option and does not necessarily translate to the paid versions. Recording meetings is easy but playback requires an extra step or two in some cases. A specific codec is required for Windows Media Player. Mac users may have to jump through hoops as an organizer must select the .WMV before recording begins or playback becomes more challenging as the file must be converted to view. Well-constructed, highly reputable video conferencing service is free for up to 3 attendees. Paid service starts at $39 and $56 a month when paid annually for 25 users and 100 users, respectively. Several easily accessible controls allow toggling of webcam, microphone and speaker options for any user. Presenter control can be passed to any user at any time. Of the many collaboration platforms on the market, GoToMeeting ranks in the highest percentile. HD video, voice and extensive options allow users to effectively communicate wherever a reliable Internet connection is found. While other options are available, the low price with respect to the rest of the industry considering the included options make this service a great option. As this is one of the most popular tools for web collaboration, it is the most familiar. Most often, people tend to seek comparisons between GoToMeeting and WebEx from Cisco. We have produced a comparison page for those curious about the differences. You can also access our WebEx Review page. We took some screenshots of the user interface while we were testing the free version in Firefox. 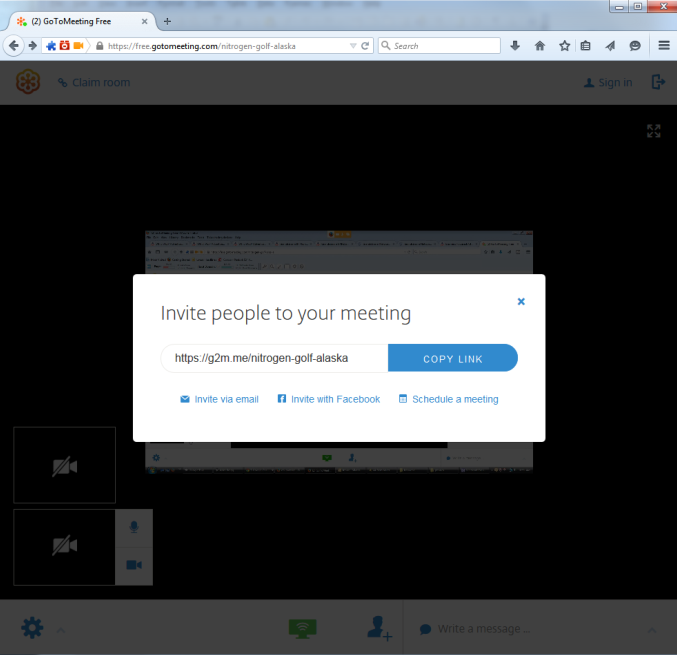 Figure 1 shows the entry screen after initiating a free meeting from the GoToMeeting website. 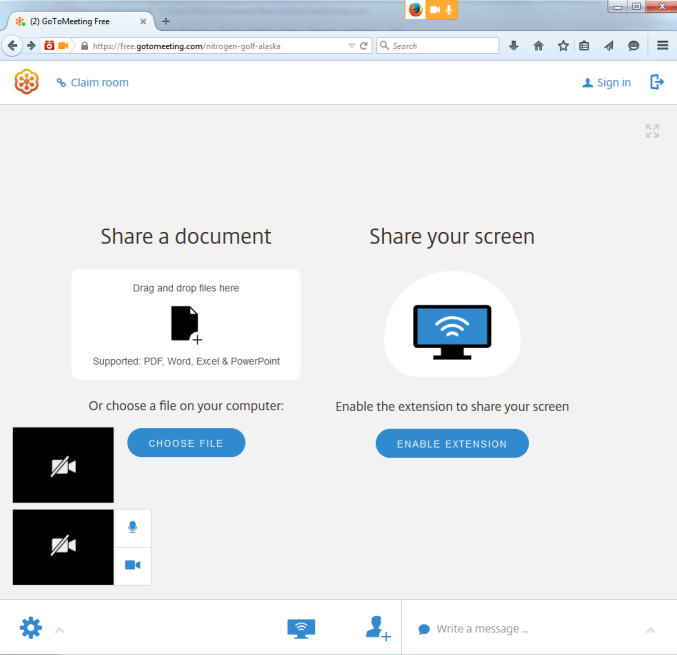 It shows the options for sharing files or your desktop (with the aid of a browser extension). To invite others click on the blue "head" icon. This will bring up the invite overlay as shown in Figure 2 with different options for inviting others. The black boxes shown in the bottom left are the video feeds of the attendees. They are both toggled off and yours can be turned on by clicking on the blue "camera" icon. Your microphone can be muted by clicking on the blue "microphone" icon. GoToMeeting reviews are listed in chronological order. Have been using GoToMeeting for about 4 years now and we basically cant run our business without it. At around $40 per month it is indispensable. I'd recommend it to any small business that requires some form of conferencing as part of its business activities.